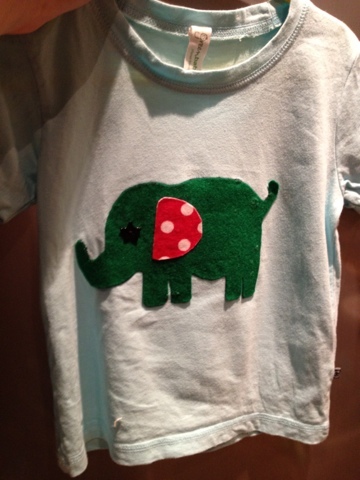 I bought some plain tees for Blake in the greenbaby sale with the intention of appliqué- ing them myself! 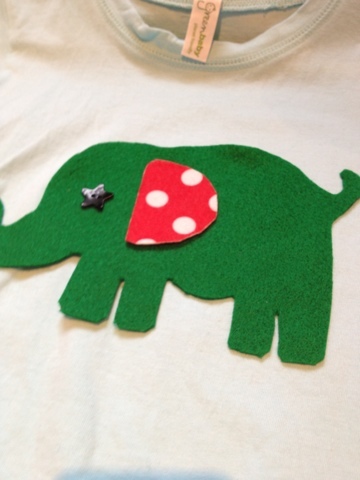 I'm not very good at crafty things or sewing (or much else really!) but I'm learning as I get great enjoyment out of it and I believe arts and crafts, creativeness and imagination are important to toddlers! 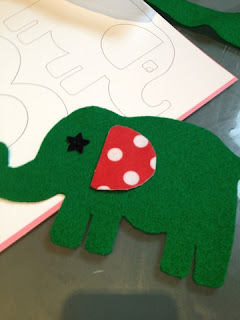 For my birthday in September I got a set of Cath Kidston books and in the "sew" book there is a cute template of an elephant which is where I drew my inspiration from. 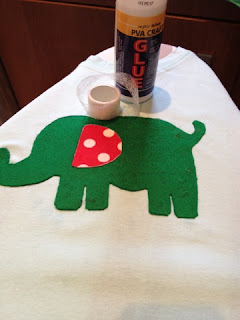 I intended to appliqué correctly but seeing as I've had the tees and book for several months and haven't had a moment to learn, I decided to cheat - well cheat isn't a nice word so let's say that instead of cheating, I did stitch free appliqué - that sounds much better! Here is my stitch free appliqué tutorial! 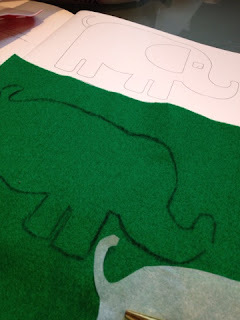 Then I cut out my template and pinned it to the felt Blake had picked out (we bought a 15sheet value pack and some loose patterned sheets from hobbycraft in Orpington- it wasn't very soft felt but it did the job) I'm not sure why, but I'm struggling to find sheets of felt that actually feel like proper felt and I suspect our felt isn't even made from wool at all! I drew around and then cut out the elephant shape from the main felt and Blake selected a spotty felt for the elephant's ear which I also cut out. 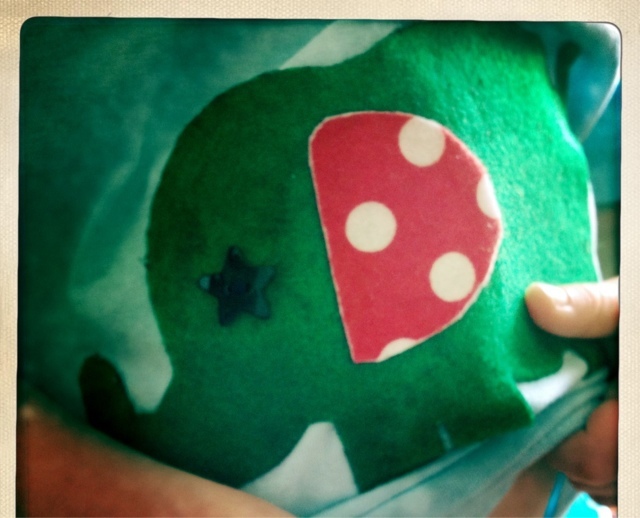 We decided on a star shape button for the elephant's eye from my button jar (this button came from Textile Garden) - I stitched the button on after I'd completed the tshirt but in hindsight I should have stitched or glued it on at this next stage! 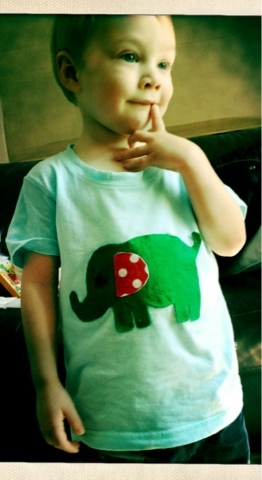 Blake decided which way and where he wanted his elephant to face and once that was sorted, I glued and wonder webbed the ear to the elephant and then the elephant to the tshirt! Make sure you get glue to all the edges of your elephant so there aren't any lose bits. I ironed over the top to secure the wonder web - I put a tea towel over the top so I don't get any glue or wonder web on the iron plate. I left it over night before Blake could wear it just to be sure the glue had set and everything. There were a few crunchy patches where the fabric glue had soaked through to the front of the felt elephant but they're not very noticeable and nothing had soaked through to the inside of the tee so I'm not worried about any irritating bits next to Blake's skin. Overall I'm pleased with the outcome - not quite perfect but that's ok - was fun to make this with Blake's help! What's next? Maybe a Robot or Setgasaurus! We have two more plain tees to decorate!